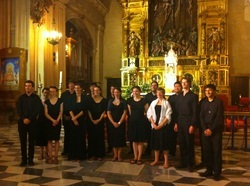 Choir Members outside Seville Cathedral. September 2012 saw the choir tour the Andalucía region of Spain visiting three of its most famous provinces: Seville, Cordoba and Granada. It had been close to three months since the last service of the Trinity Term and so we were grateful to the Reverend Aiden Platten, brother of our very own Chaplain, Gregory, for allowing the use of his church in London, St Mark’s Hamilton Terrace, to spend the afternoon rehearsing before we set off for Seville the next day. Though voices were initially a little rusty, it wasn’t long before the choir was back in fine voice and that evening we delighted the audience of parishioners, family, friends, alumni and current college members who had gathered at the Maida Vale Parish for a concert containing a selection of our tour repertoire. The music ranged from the 16th century to the modern day, including pieces by Byrd, Anerio, Viadana, Lobo, Victoria, Bruckner, Rachmaninov and Villete as well as organ solos from both the Senior Organ Scholar, Joe Mason and Junior Organ Scholar, James D’Costa. A number of the audience joined us later for drinks in a local pub and were very complimentary, wishing us the best for the week ahead. Arriving in Seville the next evening, we checked into our hotel before embracing Seville’s nightlife. Together we visited one of Seville’s most famous Tapas Bars, Los Coloniales, where we were wowed by the quality of the food – it is fair to say that the tapas we ate throughout the week was a real highlight of the trip. We then visited a local flamenco bar where we caught the end of show whilst enjoying one or two glasses of sangria. Our first full day saw us depart Seville for Cordoba by rail and spend the morning exploring the Jewish Quarter of the city including the impressive medieval Alcázar de los Reyes Cristianos. Here we met Javi Martinez, current Lincoln student, who acted as not only translator but as an invaluable guide throughout the trip with his impressive knowledge of Moorish architecture for which Andalucía is famous. This was very much in evidence when he led us around what is known in Cordoba as the Mesquita-Catedral, (The Cathedral was a former Mosque) which was the stunning setting for our first mass. We sang Byrd’s Mass for Four Voices, which was our Mass Setting for all the services throughout the tour, as well as Viadana ‘Exsultate Justi’, Anerio ‘Christus Factus est’, and Bruckner’s ‘Ave Maria’ and ‘Os Justi’. The organist of the Cathedral was very impressed, particularly by the choir favourite, ‘Exsultate Justi’, which he described as having an ‘exciting sound’. The afternoon was spent exploring a rather deserted Cordoba as the locals enjoyed a siesta – something that we would embrace more and more throughout the week! We spent the next two days back in Seville, exploring the main sights including the Cathedral and its Minaret, which offered stunning views across the city, as well as the Torre del Oro, Casa de Pilatos and the Plaza de Espana. The 14th Century Alcazar, the oldest official Royal residence in Europe, offered stunning architecture and gardens which were enjoyed by the group before we gathered to sing Mass at Iglesida del Sagrario. As well as the Byrd Mass our motets included a choice English and Spanish mix with Byrd’s ‘Ave Verum’ and ‘Miserere Mei’ as well as Victoria’s ‘O quam Gloriosum’. The Victoria was really enhanced by the acoustic of the magnificent church that was attached to the main Cathedral. The congregation offered a round of applause as the choir processed out. The second half of the tour was spent in Granada where the main sight was the spectacular Alhambra – a 10th Century Islamic fortress with ornately decorated palaces and magnificent gardens. Some members of the choir chose to visit the fortress on both the days we were in Granada, while others explored the city with one group offering a performance of ‘Now is the month of Maying’ in an exchange for a ride on a Segway belonging to the tourist office! Our first Mass in Granada was at the Parroquia de San Gil y Santa Ana where we performed for the first time on the tour Victoria’s ‘Asperges me’ as well as Pierre Villete’s beautiful ‘Hymn à la Vierge’. This was followed by an impromptu concert in the church square where we showcased some of our secular repertoire, with the large crowd that gathered seeming to particularly enjoy the English madrigal ‘Fair Phyllis I Saw’ and French Chanson ‘Margot Labourez les Vignes’. The final full day of the tour saw the majority of the choir travel to beach at the nearby town of Salobrena. An enjoyable day will surely be remembered for the foundation of the LCCBVT (Lincoln College Choir Beach Volleyball Team) which after a few successful rallies now hopes to build towards Rio 2016! One intrepid choir member, however, chose to instead take on the Sierra Nevada – to our relief, he lives to tell the tale! That evening we gathered for our final Mass at Iglesia de San Ildefonso which ended with Byrd’s ‘Sing Joyfully’: a fitting ending not only to our last service but also for those who would be leaving the choir after the tour. 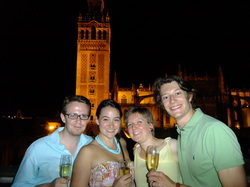 We returned to Seville the next day, where we would board our flight home. This offered a final chance to enjoy Seville’s famous Tapas restaurants before we convened in the picturesque Parque Maria Luisa, to while away the final few hours and reflect on what had been a wonderful tour. Particular thanks to the JCR, MCR and Old Members fund for the financial support for the tour as well as the Oxbridge Andalucía Rep., Ian Mclean who helped advertise our performances and came to the final Mass in Granada.